GUATEMALA – PRES. Pérez Molina REFUSES TO RESIGN … WE HAVE TO THROW HIM OUT WITH A NATIONAL STRIKE!! DOWN WITH PÉREZ MOLINA AND HIS DECADENT GOVERNMENT! FOR A GOVERNMENT OF POPULAR ORGANIZATIONS! FOR A POPULAR AND PLURINATIONAL CONSTITUENT NATIONAL ASSEMBLY! In a new, spectacular blow on Friday, Aug. 21, the International Commission Against Impunity in Guatemala (CICIG) and the Public Ministry (MP), reported that as a result of investigations into the case of customs fraud, in which the power structure known as “The Line” (“La Línea”) is involved, concluded that the top leaders of this group were former Vice President Roxana Baldetti and President Otto Pérez Molina. Based on the investigation on charges of conspiracy, with the special case of customs fraud and passive bribery, an arrest warrant against Baldetti was requested before High Court B (Juzgado de Mayor Riesgo B). The former vice president was taken prisoner in the private hospital where she had been admitted only days earlier and transferred to the military prison at Matamoros Headquarters. Sign reads Tito Arias (war pseudonym for the current president) — remember how many he killed and ordered killed. As for the president, the MP filed a request for impeachment against him before the judiciary to prosecute him for the same crimes of which they accused Baldetti. Amid persistent rumors of the imminent resignation of the president, Pérez Molina said on national television on the evening of Aug. 23 that he will not resign and rejected the charge that he was connected with The Line; he apologized for the corruption in his government, accused the business community of benefiting from customs fraud, invoked the support of the rural area in his favor, called on citizens to vote and put himself at the disposition of the legal processes that apply in order to prove his innocence. The powerful sector of the bourgeoisie represented by the Coordinating Committee of Agricultural, Commercial, Industrial and Financial Associations (CACIF), finally abandoned the president to his fate, demanding his “immediate resignation” at a news conference on Friday evening, Aug. 21. As a corollary, four ministers and five government officials who are linked to the oligarchy submitted their resignations. They are Economics Minister Sergio de la Torre, Minister of Education Cynthia Eagle, Health Minister Luis Enrique Monterroso, Agricultural Minister Sebastián Marcucci, Presidential Commissioner for Competitiveness and Investment Juan Carlos Paiz and other economics and finance officials Claudia del Águila, Sigfrido Lee, María Luisa Flores, Adela Camacho de Torrebiarte and Marco Antonio Gutiérrez. On Aug. 23, Metropolitan Archbishop Óscar Vian, representing the Catholic Church, also called for the president’s resignation. In this way, the pincers are closing in on the Otto Pérez Molina government and the Patriotic Party, starting with the first charges and arrests of April 16, driven by the CICIG and the MP. At the beginning of the crisis, the major parties in Congress, the Renewed Democratic Liberty Party (LIDER) and the ruling Patriotic Party (PP), opposed the request for impeachment against Pérez Molina that Deputy Amilcar Pop had requested. Since then, many social sectors have gradually withdrawn their support from President Pérez Molina, entrenching it instead in a sector of the armed forces and the de facto alliance between the LIDER and the PP in Congress. As we have explained in other statements, U.S. imperialism, given its need to promote the Partnership Plan for Prosperity (PAP), which aims to halt the growing migration of Central American workers toward the United States and the drug trafficking that plagues the region, has decided to promote changes in political regimes of the Northern Triangle [Guatemala, Honduras and El Salvador]. These changes aim to improve the functioning of bourgeois democracy, sweeping aside the corruption that has characterized governments and political parties there for decades. In Guatemala, fearing the outbreak of a social revolution, a section of the bourgeoisie and the army, especially the intelligence agencies and security, are using the CICIG and the MP to force the government of Pérez Molina to make changes that are necessary to prevent a mass movement from arising that can impose changes from below. But time and patience are running out quickly. In this struggle, the contradictions have led the government of Pérez Molina to the verge of collapse. For the moment, Pérez Molina is reluctant to relinquish power, but is holding on under conditions of greater weakness and social isolation. The bourgeois sector that is pressuring Pérez Molina wants the current vice president, Alejandro Maldonado, to assume the reins of power in a transitional government that will remain a puppet of the oligarchy and U.S. imperialism. The goal is to speed up democratic reforms in order to contain any mobilization of the masses. Pérez Molina must be overthrown! If anything is clear it is that President Pérez Molina will not resign. The pressure from the CACIF oligarchs and imperialism has failed to impose a Maldonado regime. 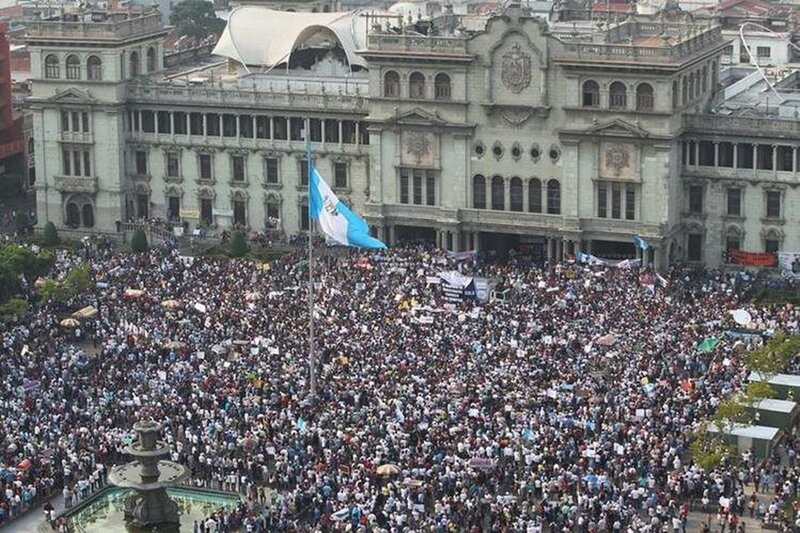 The mass marches have not had enough force to depose Pérez Molina and impose democratic reforms. Under these conditions it is necessary to increase the people’s pressure. This means that the left, the workers, the unions and Indigenous and peasant organizations, need to convene a great national strike to demand the overthrow of Pérez Molina and his government. 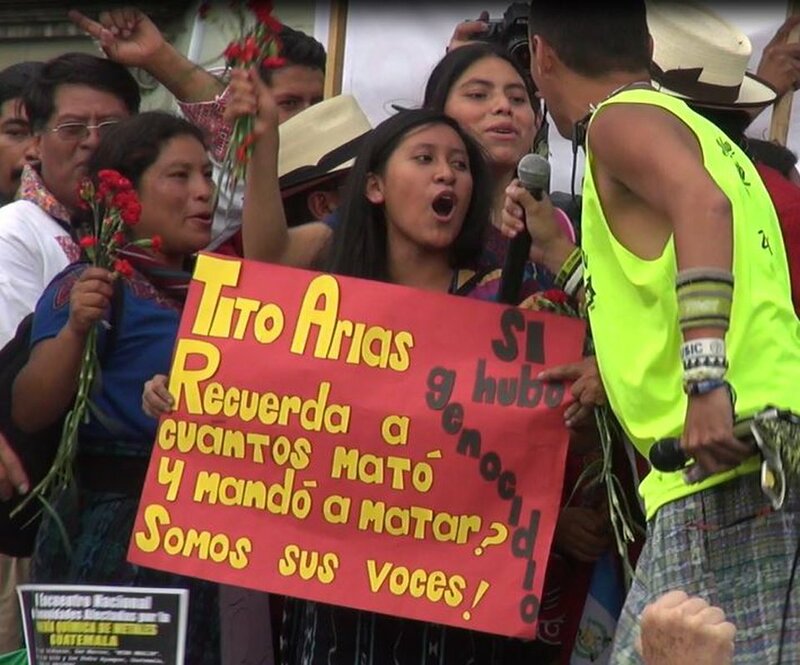 Faced with the imminent collapse of the government of Pérez Molina, we of the left, the Social and Popular Assembly (ASP), trade unions and labor, Indigenous and popular peasant organizations must establish an alternative government of working people. If we succeed in imposing this revolutionary solution, it would dramatically change the situation in Guatemala. If this does not happen in the days ahead, we will face a distinct disadvantage in the electoral challenge mounted by the current political regime, because so far it is unlikely the elections will be postponed. Two weeks before the general election [on Sept. 6], the situation is becoming very complex. Because of the tenacious opposition of the decadent major parties in Congress, the timid proposal to reform the Electoral and Political Parties Law promoted by the University of San Carlos (USAC) and the Supreme Electoral Tribunal (TSE), ran aground. In urban areas, the middle strata and popular sectors have adopted a just attitude of rejecting the traditional parties and corrupt politicians; they demand the postponement or suspension of the elections, as the electoral system has been designed to perpetuate the control of the parties that dominate the Congress. Due to the undemocratic existing electoral system, it would be ideal if the elections were suspended or postponed. Before elections are held, profoundly democratic changes should be made to the electoral law. These changes are needed to eliminate corruption in the political party system and facilitate conditions for the approval of independent candidates who reflect the interests of workers and of peasant and Indigenous communities, with the perspective of establishing a National Constituent Assembly to transform the country on behalf of the oppressed and exploited. But one thing is the ideal situation, which we all want but does not yet exist, and another is the stark political reality that we face. There are only a few days before the election, and the forces of reaction are reluctant to change the electoral calendar. The left and the Indigenous and popular movements are facing a great dilemma. The reactionary parties have imposed the electoral struggle on us. Our strategic goal should be to topple the Pérez Molina government and impose the National Constituent Assembly from below, so we must combine the methods of struggle. We must prioritize the mobilization to summon and carry out the great national strike, with the central slogan: Down with the corrupt government of Pérez Molina! At the same time, we cannot leave the field open to the reactionary forces of the current regime, which are organizing a changeover exit by holding elections on Sept. 6. The short time remaining until the elections prevents us from presenting joint candidates on the left. Despite the sectarianism that undermines the creation of an alternative government, we reiterate our call to not waste the vote, to make it an instrument of protest. We should vote critically for candidates who are Indigenous, peasant and popular representatives submitted by the Guatemalan National Revolutionary Unity (URNG-WINAQ) and the Council of the Maya People (CPO-CONVERGENCIA) parties. The more votes that the left parties obtain, the less the reactionaries will be able to impose the changeover of the government. A massive election of deputies and mayors from these left forces would form a powerful left bloc, which must continue the struggle after the elections against the current capitalist system and which on the congressional and municipal government levels can push the immediate task of building the National Constituent Assembly. The electoral front is just one of the many fronts of struggle. The struggle in the streets is more important. Regarding this issue we have insisted on the urgent need for peasant, Indigenous, trade union, popular, youth and women’s organizations and other oppressed social sectors to place themselves at the head of the demonstrations against corruption and impose their class demands, complementing the democratic demands with the heartfelt social demands of the oppressed and exploited in Guatemala. 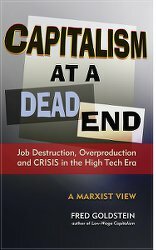 Historical experience teaches us that democratic revolutions always start as conflicts between factions of the bourgeoisie, and the socialist and popular revolutions begin as democratic revolutions, which the oppressed and exploited can use to press forward their own demands and impose the power of their organizations and parties. Because of this we have emphasized that the Social and Popular Assembly (ASP), in partnership with other effective organizations such as the National Coordination of Peasant Organizations (CNOC) and the Committee of Peasant Development (CODECA), boldly place themselves at the forefront of the protests. We wholeheartedly support the protests announced for next week beginning Tuesday (Aug. 25) by the ASP, the Teachers in Resistance and the USAC. We must demand the resignation and departure of President Otto Pérez Molina; the reform of the Electoral and Political Parties Law with deeper and more democratic proposals than those made by the Supreme Electoral Tribunal; the establishment of a peasant, Indigenous, trade union and popular government without the participation of representatives of groups or parties of the bourgeoisie; and the convening of a Popular and Plurinational National Constituent Assembly that can transform Guatemala on behalf of the dispossessed. The original version of this document was published at the website of EL SOCIALISTA CENTROAMERICANO (elsoca.org), a news site expressing the viewpoint of various Marxist and workers’ parties in the different Central American countries. Translation by Workers World managing editor John Catalinotto.